The Larsen Pavilion Skilled Nursing Center provides personalized and compassionate care in a beautiful waterfront setting. This facility provides superior care and above average staffing ratios that include on-site staff physicians and a nurse practitioner making daily rounds, as well as registered nurses, certified nursing assistants, and other healthcare professionals all focused on providing person-centered care to residents. And finally, the quality of life for every resident in the Larsen Pavilion is enhanced by the dedicated volunteers of the Pavilion Auxiliary who provide additional support throughout the facility. Planning for an upcoming surgery? The Rehabilitation Center in The Larsen Pavilion at Shell Point offers inpatient and outpatient rehabilitative and individualized physical therapy through a team of experienced physical, occupational, and speech therapists. Specialized programs include orthopedics, stroke care, memory care, dysphagia, pain management, and low vision. A dedicated occupational therapy suite and aqua therapy pool are also available. 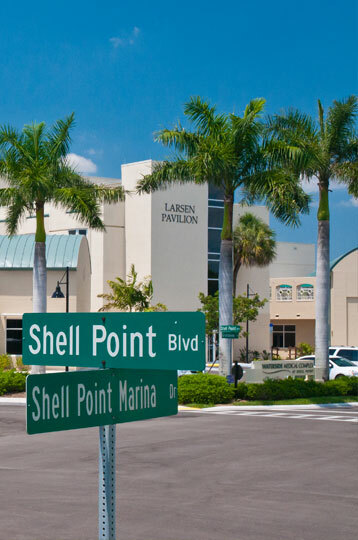 To learn more about services at The Larsen Pavilion or to register for an upcoming inpatient rehab stay, call (239) 415-5432.